In challenging the notion of the feminine archetype, artists embrace and reach beyond the boundaries of the female form to express the essence of a woman, figuratively, conceptually and metaphorically. Exhibition runs thru August 31, 2013. Featuring: Sondra Arkin, Maya Freelon Asante, David Carlson, Oletha Devane, Phylicia Ghee, Michael Gross, Nora Howell, Ada Pinkston, Edwin Remsburg, Jamea Richmond-Edwards, Rachael Rotenberg, Amy Sherald, Mary Walker, and Sigrid Vollerthun. Along with Sondheim Semi-finalists: A. Moon and Adejoke Tugbiyele. an exhibition at the Cultural Center gallery of the Inter-American Development Bank through until September 27. Mon - Fri 11 a.m. - 6 p.m.
Washington, D.C. – Award-winning, International Salvadoran-American Artist Karlisima will present her art show entitled, Green Cathedrals: Trees, Roots and Branches at the Potter's House Art Gallery, Washington D.C. from now until August 2nd, 2013. Two events will be held to meet the artist on July 20 and July 27 at 4:00 pm at the Potter’s House. Karlisima's paintings are reminiscent of stained glass windows and mosaics infused with deep spiritual meaning, intertwining the worlds of the real and the surreal. She focuses primarily on symbols of Mother Nature and her native Mayan roots. An interest in the symbolic meaning of votive candles, which she has seen in medieval and renaissance European cathedrals, is also present in her work. 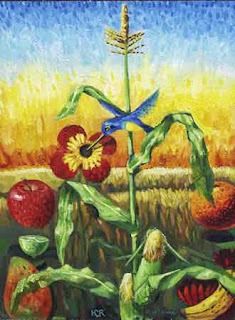 Her paintings are alive with bright, expressive colors. The strong contrasts and bold brushstrokes remind one of impressionist painters and the surrealist work of the Mexican artist Frida Kahlo. What: Meet the Artist Receptions of Salvadoran-American Artist Karlisima’s Art Show, entitled Green Cathedrals: Trees, Roots and Branches. “This exhibition is the culmination of many months of intense work, inspired by the beauty of the trees and the parks of the Adams Morgan neighborhood,” says Karlisima. The exhibition is free and open to the public from now until August 2nd, 2013. 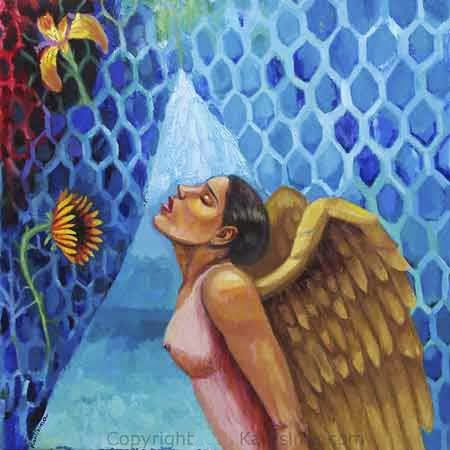 To view Karlisima’s paintings is to enter an extraordinary world of fantasy, mystery, magic and spirituality. Whether still-life or landscape, Karlisima’s art tells a story and has an abstract quality that transcends the real, the mundane and the ordinary. Her paintings are metaphors for the inner light that dwells within each individual soul. Karlisima was born in El Salvador and moved to the USA with her family at the age of 14, and has been living in Washington D.C. since 1992, when she graduated with a major in painting from Washington University in St. Louis, Missouri. She also studied French in France in 1989 and is now fluent in five languages. Her art is influenced by memories of her childhood in El Salvador, her experiences in the US, and her trips to France and Europe beginning at 19, and most recently, Paris and the Holy Land: Israel and Palestine. Her paintings hang in private collections around the world and two of her self-portraits are part of the Permanent Collection of the International Museum of Women in San Francisco. She exhibited her art in London and Berlin in 2005 and 2006. On August 7, 2012, she dedicated The Mama Ayesha’s Restaurant Presidential Mural to the public and to President Obama. The mural, 60 x 24 feet, is located at 1969 Calvert Street NW, and is a tourist destination in the Nation’s Capital, known as “DC’s Biggest Postcard On A Wall.” It can be found on PBS, Wikipedia, D.C. Tourism Books, and Norway’s Textbooks to teach U.S. History. Karlísima painted the Potter’s House Mural and the Highland’s Café’s Mural at 4706 14th St. NW, and has been teaching art to children at the Festival Center, 1640 Columbia Rd NW. Adams Morgan.